The campaign initiated July 1st by prisoners in Pelican Bay State Prison (PBSP) against the torturous conditions of long-term isolation has received broad support going on for weeks now. The California Department of Corrections and Rehabilitation [sic] (CDCR) has admitted that 6600 prisoners refused food trays last weekend across 13 of their 33 prisons. (1) Meanwhile, numerous organizations have organized demonstrations and mobilized support across the United $tates and Kanada leading up to and following the start of the hunger strike. Over five thousand people have signed an online petition pledging their support. Volunteers with MIM(Prisons) have interacted with thousands of people on the streets inside and outside of California with info on the hunger strike, gathering dozens of signed letters and a handful of donations. According to CDCR 1,600 prisoners remain on food strike one week after the start. (2) The media is reporting a sharp drop in the number of prisoners refusing food in a tone that implies the strike is losing steam. But this is hardly the case. Many prisoners we've heard from outside of Pelican Bay only pledged to strike one or two days in solidarity. One reason for this is because it is hard for them to know when the strike ends or what is happening despite the efforts of outside supporters to send updates. Even in Pelican Bay many of those protesting specified the number of days they would fast beforehand. Only a minority of participants have pledged an indefinite strike until the demands are met. The rest of us work in solidarity with them until the end. Despite all the noise being made, word from those organizing to mediate negotiations is that the CDCR is refusing to negotiate with strikers or mediators. (3) We know the CDCR has been talking to hunger strike organizers, but it seems that no resolution is in the works as of July 8. We've seen the ripples of this campaign in our own work as we connect with many new people in California and reconnect with people who we have been cut off from by the state. We've also seen record traffic on our website with the hunger strike campaign page and the article featuring the prisoners' demands bringing in a lot of hits. This increase in readership is a direct result of the organizing of prisoners in California. However we must admit that a good chunk of the traffic is coming from state officials trying to gather intelligence from our reporting. Donations we've collected so far are less than a tenth of the printing and postage expenses for outreach, mailing protest letters and sending communications to prisoners in California. As always, we can use donations of money and labor to keep up with this important work. 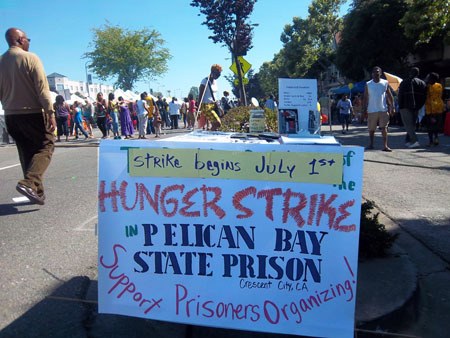 The hunger strike comes almost a year and a half after a formal complaint was filed with the governor of California regarding the torture and violation of Constitutional rights that prisoners face in Pelican Bay. After being ignored by official channels, they turned to outside supporters who came together and organized a press campaign and negotiation support. There was enough lead time that MIM(Prisons) was able to send campaign info to all of our California subscribers prior to the strike. We also hit the streets to gather signed letters of support and explain to people the importance of this struggle leading up to the strike. Demonstrators support the demands of Pelican Bay prisoners at a march to reduce incarceration in California marking 40 years of the U.$. war on the oppressed called the "War on Drugs." 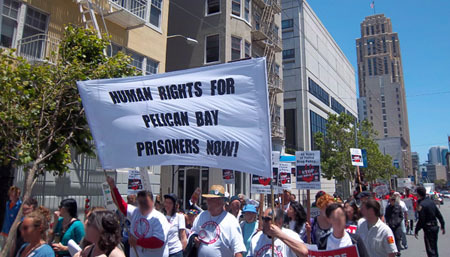 A rally in San Francisco in June against the drug war featured the Pelican Bay prisoners' demands prominently. A comrade representing MIM(Prisons) spoke on the upcoming hunger strike, stressing that Pelican Bay was developed as a tool to repress political organizing in the California prison system and that those being targeted with indefinite SHU terms are largely leaders and influential people among the imprisoned oppressed nations. A former California prisoner also spoke about the torturous conditions in Pelican Bay, urging people to support the hunger strike. During the march, supporters of the "Revolutionary Communist Party - USA" (rcp=u$a) were chanting, "Once we have the revolution, there'll be no mass incarceration!" Which revolution are they talking about? Even on a simple issue like opposing torture in prisons, rcp=u$a's idealist/chauvinist colors showed through. As we point out in every issue of Under Lock & Key, all Amerikans should be viewed as criminals who need to reform under the dictatorship of the proletariat. When the revolution finally hits U.$. soil there will likely be an increase in incarceration of U.$. citizens, as the majority of the world experiences freedom they have not seen for centuries. The difference is that proletarian prisons focus on reform and reintegration into society not torture and isolation as the imperialist system does. Comrades spread word of the upcoming strike at a Juneteenth festival celebrating the struggle of the Black nation for freedom in Amerika. Once the strike began, MIM(Prisons) stepped up efforts to reach the public about the sacrifices and struggles of our comrades in prison. While comrades were able to reach visitors coming to CDCR prisons with fliers and letters of support, repression was reported from a few public spaces inside and outside California. In one case police forced comrades to leave for accepting donations without registering with the state, in others merely handing out fliers on public property got shut down. One police officer claimed that activists could not set up a table on a public sidewalk to solicit support for the strike, contradicting California laws and illegally shutting down our free speech. There are contradictions in a country that locks 100,000 of its citizens in isolation cells and prevents people from distributing leaflets in public space to support their struggle against torture. Their repression only strengthens resistance, and this campaign is a prime example of that. It is ludicrous to consider the label "free country" for a country that does not even provide equal access to political dialogue to all people. In addition to talking to people on the street, comrades made efforts to reach people through independent media and art. MIM(Prisons) hosted a video clip on its website from the documentary Unlock the Box explaining the history of control units and how they were developed to repress those whose politics were in opposition to the state. Comrades also did outreach at hip hop shows and talked to a revolutionary Chicano group called BRWN BFLO who pledged active support to spreading the word about the hunger strike. 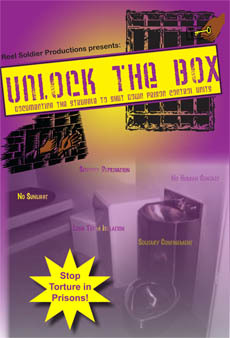 Allies in the United $tates and Kanada hosted screenings of Unlock the Box as part of the campaign. Other organizations did interviews and programs on various radio shows. Those doing outreach reported many interactions with people who had been in Pelican Bay State Prison, in some cases multiple people in the span of a couple hours. All strongly agreed with our criticisms of the conditions there. However, some people concluded that there was nothing that could be done, and that oppressed nations will always be treated this way. There is a common attitude among current prisoners as well that struggling is useless. The SHU was invented to reinforce that idea. The best way to change those people's minds is by showing them the possibilities. We do that by fighting smartly, as these comrades in Pelican Bay have done resulting in people all over the world knowing about their fight. 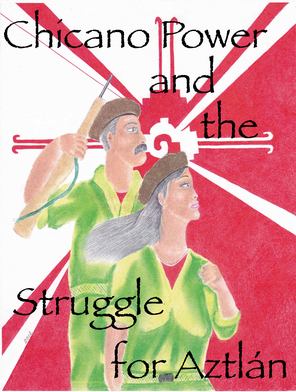 Serious, diligent organizing work is needed in our struggles for liberation, and basic rights such as the right of association, communication with the outside world and access to educational materials and programs. There are no quick fixes. 1. KPFA Morning News. 6 July 2011. 2. LA Times. 9 July 2011. Support Freedom of Association in Prisons!